Patch 2.2.8 for YR Red-Resurrection has been released! This one's been somewhat delayed but it has all been for good reasons. In the background, or rather on the discord channel, this patch has been gestating and tested on a weekly basis to include bigger changes than can be achieved in a simple one month patch! EUROPEAN COUNTRY REWORK- Chrono Legionnaires have been moved to T3, and Sonic Enforcers moved up to T4, with related balance tweaks. This is to help make Europe slightly easier to combat on T3, as the Sonic Enforcer/Bishop combo was incredibly powerful, but it also provides them with more mobility and versatility earlier on. Chrono Legionnaires were also underused in multiplayer, making them more relevant now. Furthermore, Speedways have been completely removed and instead Warp Nodes now also buff the speed of surrounding units. UNIVERSAL SELF HEAL CHANGE- Thanks to a new feature from AlexB, the developer of Ares, it is now possible for combat to prevent self healing- and that is applied to Red-Resurrection. Now, a unit will not self heal for 10 seconds after taking damage. This is great as it prevents certain units being unkillable in certain situations due to out healing damage, such as a single Rocketeer vs a Crazy Ivan. This affects most units in the mod, so healing may be adjusted in future patches to compensate. TWENTY-TWO BRAND NEW MULTIPLAYER MAPS- many made exclusively for this mod, and all of great quality! And dozens more changes, including many balance adjustments, bug fixes and graphical tweaks. 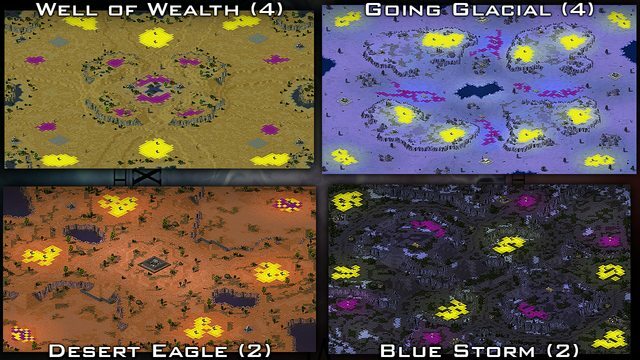 Here are a few of the new maps.